How much are other organisations investing in policy management—both in dollars and FTEs? Are my top policy management challenges similar to those of my peers? How are my peers measuring whether their policy management program is effective? Does automated policy management software make a difference in program effectiveness? 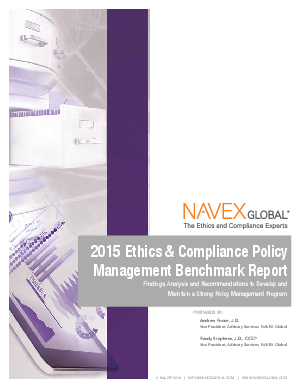 To answer these and other critical questions, NAVEX Global partnered with a research firm to conduct an anonymous survey of nearly 900 ethics and compliance professionals about policy management. Those findings have been gathered in 2015 Ethics and Compliance Policy Management Benchmark Report; the most definitive set of industry benchmarks ever compiled. Download the report now to get benchmark data and practical recommendations from NAVEX Global experts that you need to make better decisions and take your policy management program to the next level.